Your Avid editing bay is incomplete without this book! The Avid Media Composer 6.x Cookbook is a fantastic source of information for users of all different experience levels. A beginner can pick this book up and have a solid understanding of the program by the end. Being a more advanced user myself, I picked up many helpful and time-saving tips after reading through it. It walks the reader through things step-by-step, with screenshots of some of the more difficult and in-depth tasks. The typical instructional section will start with “Getting Ready,” then to “How To Do It…” and finally, “There’s More…” giving a really thorough look at the task at hand. Items covered run from the simple (Exporting a Still Image) to the complex (MultiCamera Mode Editing). There is also ample additional information about various terminology within the program that is written in plain English as well as 3 appendixes with even more information. 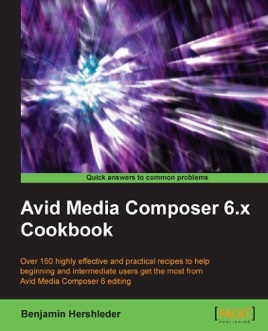 The Avid Media Composer 6.x Cookbook is less a “cookbook” than an encyclopedia! This will make a very useful reference book for anyone who utilizes Avid Media Composer 6 – your editing bay would be incomplete without it. Highly recommended.